Come enjoy the family dog, cheer canine athletes, celebrate the human/animal bond, and help raise funds for and awareness of the plight of homeless dogs by attending the 24th Annual Dog Olympics at the NC State University College of Veterinary Medicine from 10 a.m. to 2 p.m. on Sat., Sept. 10. Dogs of all breeds, shapes, and sizes are invited to participate in athletic and non-athletic competition such as Limbo, Musical Sit, Howling Contest, Longest Tail, Roll Over Rover, High Jump, and the Frisbee Toss. A new competition this year is a demonstration ring for the youngest canine handlers to be able to present their pet’s skills. Among the scheduled demonstrations are Officer Phil Humphries and Robby of the Cary K9 Unit, Flyball with Dog Gone Fast, Canine Good Citizenship Testing with Helping Paws International, and a demonstration by Triumphant Tails. 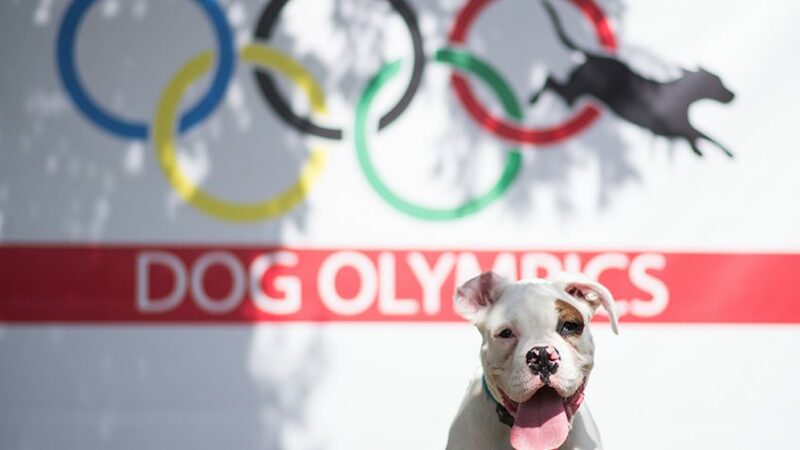 An Olympic Village will feature 13 shelters and breed rescue groups, canine health information booths including the CVM Seizure Studies Program, NCSU Libraries, more than 20 vendors offering canine-related goods and services, and food trucks. 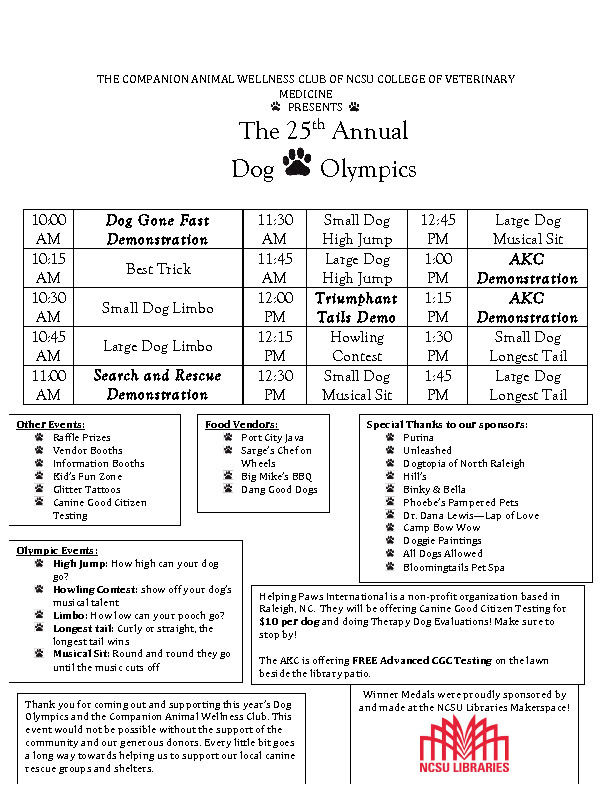 The annual Dog Olympics is a great family day and provides an excellent opportunity to further socialize well behaved dogs as well as an opportunity for a family considering adding a pet to the home to observe all breeds of dogs and talk with their owners and representatives of various rescue groups. Admission for owner and competing canine athlete is $5 with the cost covering an entry fee for one event and access to a digital photo of the canine champion on the Olympic platform. Each additional event and photo is $2. Admission for owner and a non-competing dog is $3. Admission for an individual is $1 while children age five and younger are free. All proceeds support the rescue groups in attendance. Rain date is September 24. 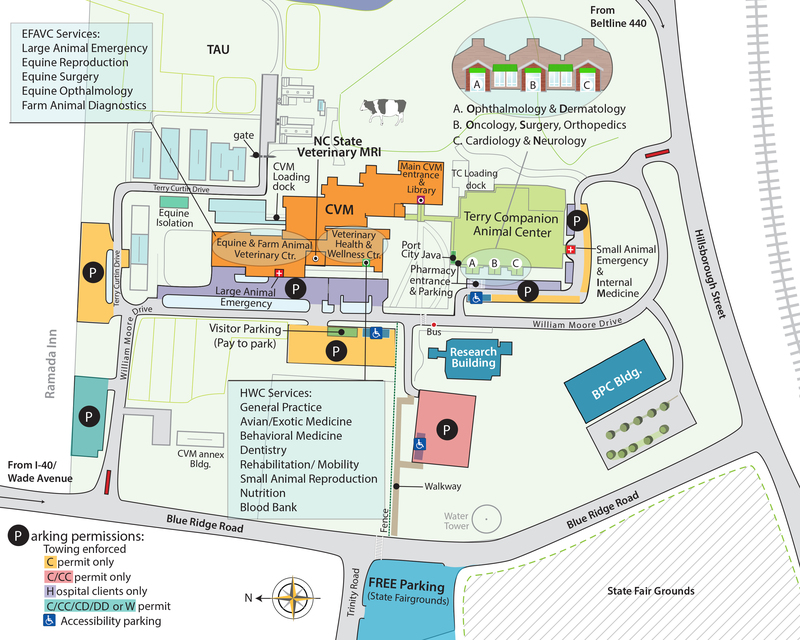 Note: The College of Veterinary Medicine is located at 1060 William Moore Drive at the intersection of Hillsborough Street and Blue Ridge Highway. Directions. All dogs must be current on all vaccinations and kept on a leash until competing. No dogs under four months are permitted. Visit the Dog Olympics page here.